A GOLDEN SLIPPER runner at 2, a Group 2 winner at 8 – with the small matter of nearly $1.5 million in prizemoney along the way; Dothraki is one of Australia’s most popular horses in training and on Saturday, the evergreen son of Mossman makes his 50th career start, six years to the day after claiming his first victory as a baby-faced two-year-old at Canterbury in 2012. Dothraki has taken his owners on an incredible and thrilling journey in racehorse ownership. One that has spanned Australia’s most prestigious prizes and Stakes wins at Randwick, Rosehill, Flemington and the Gold Coast. Now an eight-year-old, the $45,000 Magic Millions purchase has earned $1,463,135 in career prizemoney, and has won or placed in an incredible 28 of his 49 runs, claiming his greatest career triumph to date in the Group 2 Bobbie Lewis Stakes at Flemington in September this year. On Saturday, he heads to Doomben where he takes on the Listed Magic Millions Falvelon Stakes over 1100m, on his way to what would be a third appearance at the lucrative Magic Millions Raceday on January 12. Carrying a top weight of 61kg, Dothraki takes on 15 rivals as he bids for victory from barrier 12, with Jim Byrne in the saddle, a Group 1 winning jockey in The Red silks when delivering Redzel to victory in the 2017 Doomben 10,000. 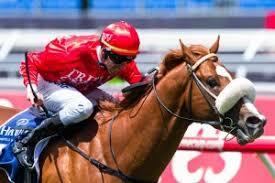 Best of luck to his owners and let’s hope we’re celebrating a winner for Dothraki’s 50th start!